After I discovered anki, a tool to assist in remembering facts, I started to actively use it. Among other uses, I want to keep in memory some important chess positions. To display these positions in anki, I have written a plugin. 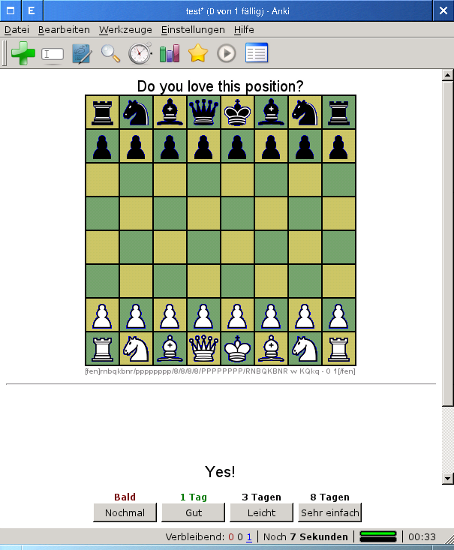 Download chess fen plugin for anki (version 20110627). The README-file is below, now two screenshots. The plugin converts “fen” tag to a corresponding image. :: Do you like this position? The images are generated and stored in the deck’s media directory. the command line, see the comments inside “chess_fen.py”. Install the fen plugin from the anki plugins repository. This entry was posted by olpa	on Monday, June 27th, 2011 at 3:01 pm	and is filed under chess. You can follow any responses to this entry through the RSS 2.0 feed. You can leave a response, or trackback from your own site. I am a software engineering student. I want write a Anki plug-in for my final project. How can I start? Can you give me some advice? As far as I know, there is no documentation how to write plugins. I downloaded and investigated existing plugins, it was enough as starting point. Nice plugin. Thanks for creating it. Good Idea! Could you implement the same plug in for Ankidroid? Unfortunately, no. I do not have Android. No problem, of course I didn’t have to ask you but to Ankidroid’s developers! Anyway, I actually did and and the latest Ankidroid alphas support fen-to-chessboard conversion. We’re also figuring out some interesting attributes for the fen tag, such as orientation=white|black (white by default), to properly flip the board in case you want to remember some positions, variations, opening lines by the black point of view. It should be extremely easy to implement and a huge improvement for chess learners. What do you think? > the latest Ankidroid alphas support fen-to-chessboard conversion. I thought about adding attributes, but finally decided against them. Mostly because I did not want to work on decorations. The only arguable attribute is “orientation”. I decided that for me and other experienced players the orientation is not important, and non-experienced players should learn chess without anki. In any case, if you implement attributes, it is great and I support your effort. As for my plugin, I’ll correct it to ignore attributes. This way, android-anki cards would not fail in the classical anki. > As for my plugin, I’ll correct it to ignore attributes. This way, android-anki cards would not fail in the classical anki. Well, that’s something. Thanks for that! Could you let us know when it’s ready? A message here is OK, I’ll enable followup comments notification. Thanks for the plugin! I’ve been using it to study tactics exercises that I wasn’t able to solve on my first attempt as well as positions from my games where I missed a winning move. Although it is in my TODO-soon list, I still haven’t tried Anki 2. For Anki 2.0, replace everything after # Anki Mode with this code. I messed around a little with the output, removing the displayed FEN notation and adding an indication of the side to move(I wanted to adapt it for use with tactics problems). It’s easy enough to add it back in if you want. Would it be possible for you to modify the code a little so that the board automatically reverses if the FEN indicates that it’s black’s move. The regular expressions are throwing me somewhat.